Ocean Notion, a non-profit organization created by residents of the East Coast, is on a mission to preserve the ocean through cooperating with corporations, cleaning up beaches and offering educational outreach in the community. Peter Mitchell, co-founder and CEO of the non-profit organization, explained how Ocean Notion was formed this past February. He said that last year, Tristen Rodgers and himself had the idea to start it, and asked their friend Martin Naro if he wanted to help. Mitchell said that he and Rodgers started doing their own beach cleanups and realized there was only so much that a couple of people could do to make a difference, so they started Ocean Notion. He wanted to start to give back and said that if he engaged with the community more, he would be able to utilize his surroundings and really make a difference. 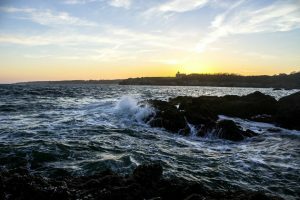 Catherine Barr, the environmental journalist in Ocean Notion, said that the organization is working to become nationally recognized, but right now there is only an official Rhode Island branch. Mitchell explained that Ocean Notion is currently in the process of expanding to Connecticut, Oregon and Washington. To do this, he said they use college communities as an outlet to reach the community in that city or state. Additionally, Barr explained that Ocean Notion is working with a corporation to implement and enforce the recycling program. On a simpler scale, Barr said that the organization does a lot of beach clean-ups. So far, they have removed 2,200 pounds of trash. Right now, Barr said the organization is acting upon educational outreach in the community. She explained that Ocean Notion is working with a local Rhode Island high school to get a program started with AP environmental science or other environmental specific classes. By doing this, the organization hopes to bring awareness to recycling plastic and paper, instead of just throwing everything out. She said that it’s really important to reuse these items, even if it’s not possible to reduce them. Barr, who is a sophomore at the University of Rhode Island and double majoring in environmental science and elementary education, said that she joined the organization because she loves being close to the ocean. Being a Chicago native, Barr had only ever been around lakes before coming to Rhode Island. She said that the organization’s mission statement talks about how important the ocean is to us and our daily life, including simple things, like just breathing. In the future, Mitchell’s goal is to help more corporations in the country to transition to a more effective recycling program. He said that this would entail working with corporations and local departments of environmental management offices to essentially set up recycling routes. This will increase recycling among employees and overall emphasize recycling within their company. So far, the organization has four members on the executive branch level, seven positions at the URI branch, and about 120 volunteers. Mitchell said the branch at the university is funded by the nonprofit itself, through their ocean conservation fund. Barr said that the executive branch has emphasized how important it is to make sure their mission statement and what they do is very manageable, stable and doable. She said that Ocean Notion wants to ensure that they have a strong foundation — strong enough to be founders. Through dependability and small steps to spread on the East Coast, they hope to continue on the West Coast as well. To get involved with Ocean Notion, visit their website at ocean-notion.org and find the organization on social media. Meetings are held every Thursday at 5 p.m. in the Center for Biotechnology and Life Sciences (CBLS) on the fourth floor, and all are welcome.